You know how some recipes look absolutely amazing, but sadly involve about a billion and one steps, chopping up 23 ingredients and using a separate cooking technique you probably have to go to culinary school to understand for each one? Not to mention the 15 gadgets you can't afford, let alone know what they are or what they do. Okay, so maybe I'm exaggerating slightly, but you know what I mean. Well, this? This is not that. This is really and truly quite simple, involves only about 5 steps, requires chopping only 1 ingredient and involves methods I'm pretty sure you've heard of ("whisk," "toss," "cook," and "bake," anyone?). Oh yes, and the only gadget you need is an oven safe skillet (but really, if you don't have one of those, just transfer the chicken to a baking pan for the oven and you're good). So, no excuses for you! Make this chicken!! Really, we were so impressed with the flavor of such a simple dish- it really could outdo anything at Panda Express and even give P.F. Chang's a run for its money! 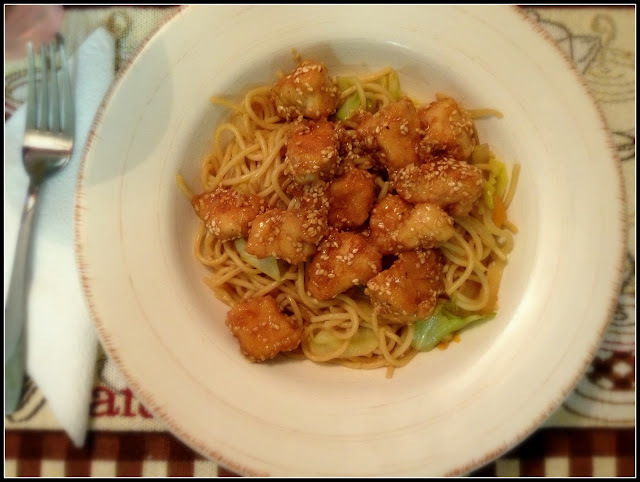 The chicken is tender and flavorful, having that perfect sticky "crust" on the outside which of course is the perfect vehicle for toasted sesame seeds. The first time I made it, I served the chicken with some steamed asparagus mixed in, over hot cooked white rice. The second time I served it over some stir fried noodles and veggies. If you want to do the noodles, here's what I did: I chopped some cabbage (about 1/3 of a head), a carrot, a stalk of celery and 1/2 an onion. I had some leftover spaghetti, so that's what I used for the noodles (you can use some kind of fancy oriental noodle if you like). I stir-fried the veggies in some olive oil and sesame oil till they were crisp tender, then added some noodles and a mixture of 1 TB soy sauce, 1 TB brown sugar and 1 TB vinegar and stir-fried until the noodles were hot. They were delicious!! Oh, and a "pro tip"? If you don't have the sesame oil, go buy some! I didn't have any the first time, but the second time I did and it made a huge flavor difference! Definitely worth purchasing!! To toast sesame seeds: preheat oven to 350. Spread seeds on an ungreased baking sheet. Toast in oven 10-15 min., watching carefully so that they don't burn. Remove when seeds are fragrant and lightly browned. Set aside. 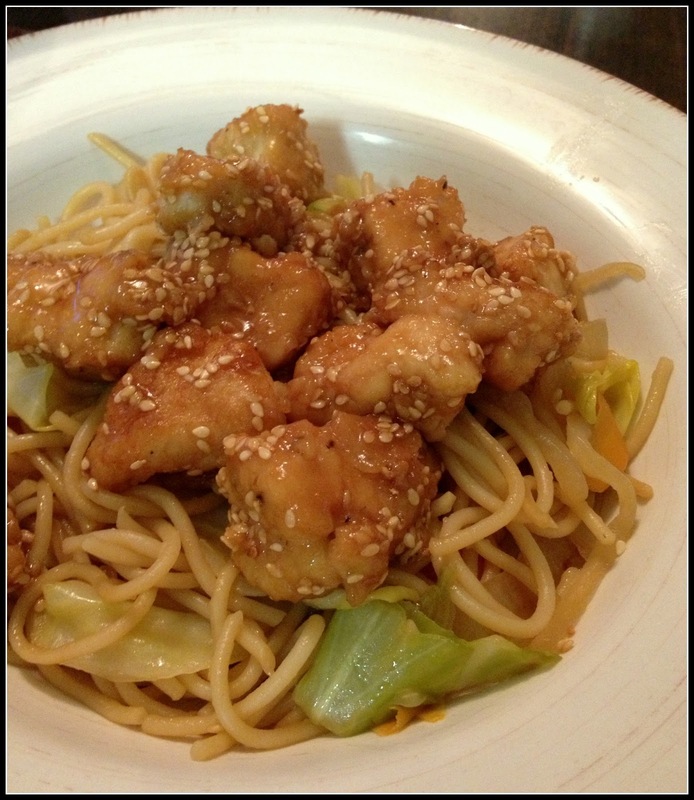 In a bowl, whisk together chicken stock, brown sugar, 1 TB sesame oil, garlic powder, soy sauce and vinegar. Set aside. Heat a large oven proof skillet over med-high heat. Put flour, salt and pepper in large resealable plastic bag. Add chicken pieces and shake until evenly coated. Add olive oil and 1 TB sesame oil to skillet and once hot, add chicken pieces in a single layer. Cook until seared and golden on one side (about 2-3 min. ); flip and cook until golden again. Pour sauce mixture over chicken and toss to coat. Turn off heat and place skillet in oven. 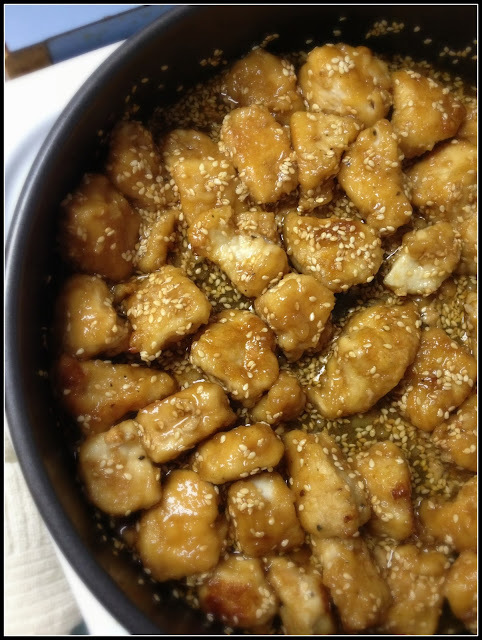 Bake for 20 minutes, then remove and sprinkle with sesame seeds. Serve over hot cooked rice or noodles with your choice of veggies. That looks really yummy! I've got sesame oil in the fridge. I love the way it smells.